Hang on to your hats, ladies and Gentlemen!!! 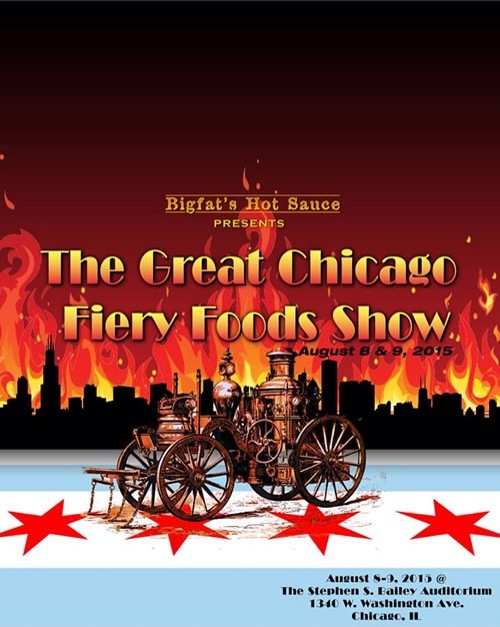 Bigfat’s Hot Sauce is bringing a fiery foods show to the amazing city of Chicago! Check out the press release that’s hot off the press!!!! And why would the bring a show to Chicago?! Because, Ladies and Gentlemen, It’s a Fiery World!!!! It’s time for the Windy City to bring the heat! Niles, IL, August 18, 2014: Breaking news! Today, it’s been announced that Jeremy Walsh, founder of Bigfat’s Hot Sauce, after months of research consulting with other fiery food companies, will be hosting the first ever Great Chicago Fiery Foods Show on August 8 & 9, 2015 at the Stephen M. Bailey Auditorium located in Chicago’s popular West Loop. This show will feature some of the best spicy food vendors from across the country as well as great local companies and products. Save the date, and stay tuned for more details! Steve Seabury owner of High River Sauces and the organizer of the NYC Hot Sauce Expo will present to the world the official Hot Sauce Hall of Fame Foundation. The Hot Sauce Hall of Fame will induct 5 people in its inaugural year and each of the following years they will induct 3 all of which have been very instrumental in the fiery foods industry. Each year the NYC Hot Sauce Expo will present and host the induction ceremony to enshrine the legends of the industry to this greatest of honors. The Hot Sauce Hall of Fame enshrinement ceremony will be held on Saturday April 25th on the main stage after the Screaming Mi Mi Awards show. Inductees will receive a distinctive red jacket, an achievement trophy and will be featured on exhibit at the Hot Sauce Hall of Fame Library each year at NYC Hot Sauce Expo. 1. Blair Lazar – Owner Blair’s Sauces and Snacks also came out with one of the if not the first extract hot sauce. Took the collector sauce/limited edition sauce to new heights. Also took extreme heat to the limit with some of the hottest sauces ever. 2. Chip Hearn – One of the original hot sauce websites, as well as one of the first, and one of the largest national zesty distributors, Peppers.com. Inventor of the Bloody Mary Smorgasbord in 1978. Originated the “risqué” hot sauce genre at the 1989 National Fiery Foods Show. 3. David Ashley – Owner Ashley Foods. Another one of the first users of extract sauces in the early 90’s. Was one of the first to collaborate with and have celebrity driven sauces. 4. Dave DeWitt – “The Pope of Peppers” – Author and maybe the original “Chilehead” Started the Fiery Foods Show 26 years ago and set the standard for The Big Hot Sauce Show. 5. 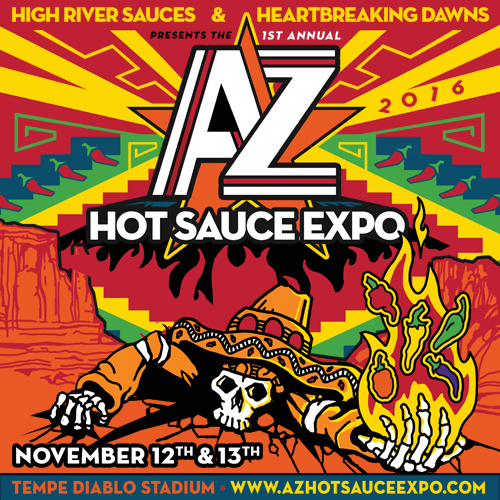 Dave Hirschkop – Owner Dave’s Gourmet and creator of Dave’s Insanity one of the, if not the 1st extract hot sauce. Was one of the first to create “limited edition sauces” and was instrumental in the collector hot sauce craze. 6. Dave Lutz – Founder of Hot Shots Inc. one of the original hot sauce distributors and still operating for almost 20 years. 7. Edmund McIlhenny – Created Tabasco in the 1860’s and is the best-selling hot sauce ever. 8. Jim Campbell – Was one of the first pepper growers who supplied hot sauce companies their peppers from their early starts. Was very instrumental for the early success of some of the leading hot sauce makers like Blairs, CaJohns and Dave’s Insanity. 9. John Hard – Owner of CaJohns Hot Sauce. The God Father of the hot sauce industry. Started in 1996 and has garnered over 200 regional, national and international awards. 10. Marie Sharp – Owner Marie Sharp’s Fine Foods Ltd. – Started making sauce in the early 80’s and actually was the creator of Melinda’s Sauces. Her sauce is the quintessential Central American hot sauce with amazing flavor and great heat! To be eligible for the nominating or voting process, a person must operate within the fiery foods industry for a minimum of 3 years. These people will be known as the Selection Committee which will consist of hot sauce companies, retailers, distributors, exporters, chile pepper growers, media and restaurateurs who specialize if spicy foods and hot sauce. The Selection Committee will be polled by email from the Hall of Fame’s Senators Board in which the board will eventually narrow the Selection Committee’s ballot to a list to 10. After the nomination process The Selection Committee will then receive the final ballot from the Senators Board. To be elected, a finalist must receive the top 3 votes from the Selection Committee. If a person has been nominated 3 separate times by the committee and does not get inducted their name will be removed from future elections for a waiting period of 5 years.